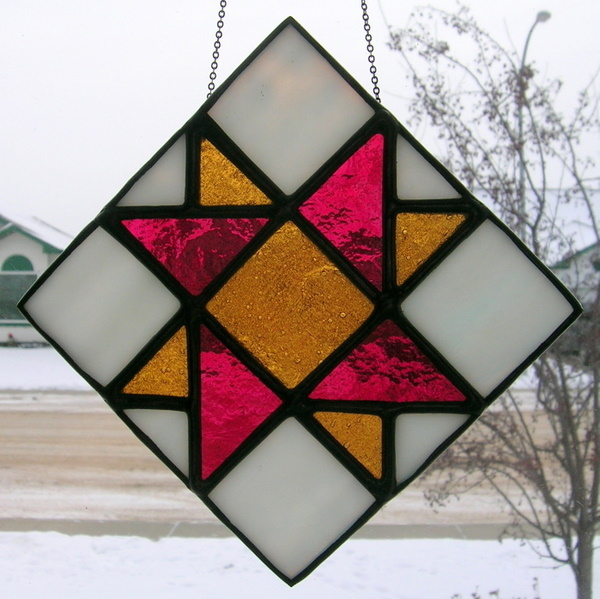 In 2007 we made this Quilt Block use Bullseye (Red), Spectrum (White) and the Gold came from an old broken window, which we rescued before being disposed of. 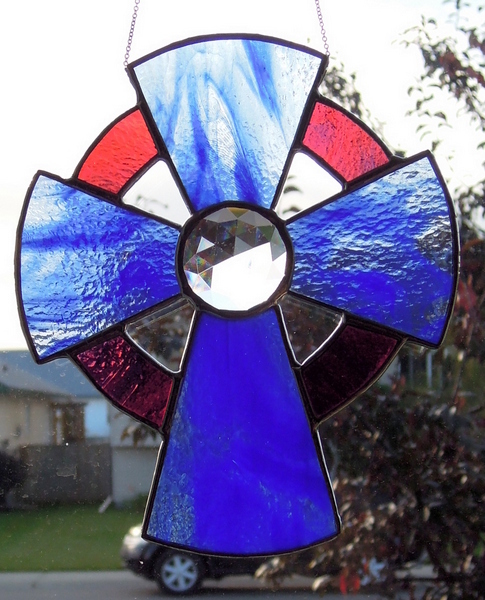 A number of years ago we made this Celtic Cross with a 1 inch jewel in the center and used all Bullseye Glass for this beautiful stained glass suncatcher. 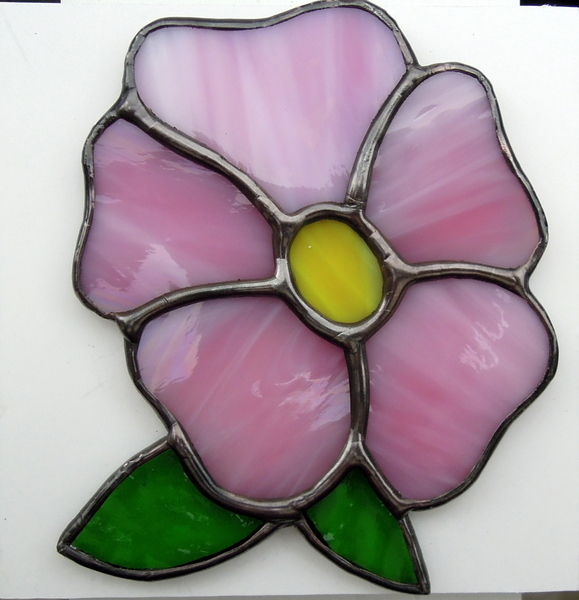 Over 450 Alberta Artists in all different types of mediums are taking part in a huge Alberta Flood Rose Project. Each artist has submitted in their medium a 4 inch x 4 inch impression of the Alberta Rose. The Project’s plan is to mount 100 of these unique artist’s impressions together in a large panel(s) and later in August hold a huge fund raising auction to help with the devastation created in late June from the huge flooding in High River, Black Diamond, Turner Valley, Bragg Creek, Canmore, Calgary and many other areas in Southern Alberta. These unique panels will be an inspiration to Albertan’s and no doubt some large corporate purchasers will hang them with great pride in their respective office towers. 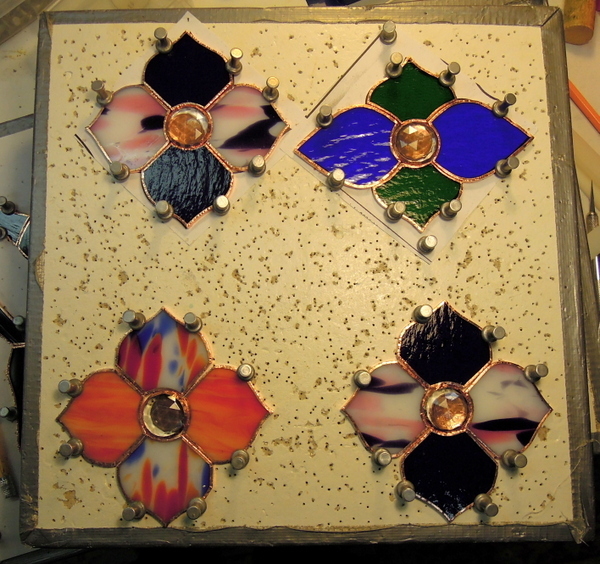 We of course made our stained glass Alberta Rose mounted via wires inserted in the back solder seams then inserted through a 4 x4 inch piece of fiber board held by twisting the wires together through small washers then covered with duck tape. Professional photographs of each entry will be taken and eventually a book will be made available with all of the submissions etc. We will provide further updates. We also were stranded in Banff Alberta, by this unprecedented flooding and eventually were allowed to head west on the only open road on June 22. We had to drive all the way to Kamloops BC then north on the Yellowhead highway to Jasper National Park, staying overnight in Hinton, Alberta then back to Innisfail via Drayton Valley and Rocky Mtn. House a detour of some 1,460 ks. We saw lots of flooding along the way but nothing like seen in High River, Canmore, Calgary etc. 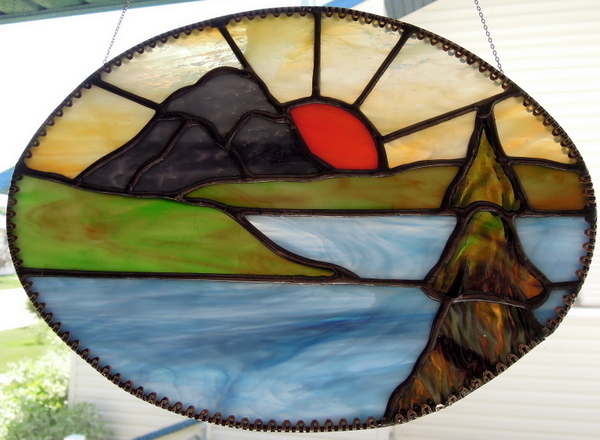 We were asked if we would donate a piece of our work to The Central Alberta Constituencies – Wildrose – Classic – Golf – Tournament held on July 18, 2013 at Alberta Springs Golf Course located near Red Deer Alberta as a silent auction fun raising item.